Today, Japan’s lower house of government, the House of Representatives (broadly equivalent to the House of Commons in the UK, and rather less equivalent to the US Congress), has passed bills permitting Japanese military forces to participate in action against nations which are not directly attacking Japan. This will be the first time since the end of the Second World War almost exactly 70 years ago that Japan has permitted itself this right, and represents one of the largest changes to the nation’s security policy since its independence was restored by the Allied occupation in 1952. It’s not a popular change. Opinion polls suggest that fewer than 30% of Japanese people support the bill, opposition parties have protested that the bill is being railroaded through parliament, and tens of thousands of people have gathered at rallies in Tokyo over the past few weeks to protest the legislation. It’s not popular with constitutional scholars, either; Japan’s post-war constitution, authored by Americans but supported by a majority of the Japanese people, renounces war and the use of force in international disputes, and forbids the maintenance of “war potential”. 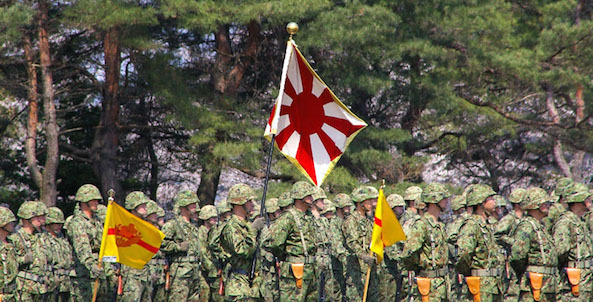 Last year, the government sought and achieved the latest in a series of revisions to the legal interpretation of that article (Article 9), which would allow the Japan Self-Defence Forces to participate not only in direct self-defence of the Japanese nation, but in “collective self-defence” – the right to assist Japan’s treaty allies should one of them be attacked, even if that attack is not directly on Japan itself. Today’s bill is the next step in pushing that change into law, but constitutional scholars remain convinced that the reinterpretation has stretched Article 9 past breaking point; a large majority of them have come out against the bill. The prime minister, Shinzo Abe, knows it’s not a popular bill. After it passed the committee stage yesterday, he commented that the government has failed to explain the bill adequately to the public and will need to work on that in future; it’s easy to roll one’s eyes at such a statement, but this sort of cart-before-horse, father-knows-best approach is pretty much de rigeur for politicians all over the world when matters of national security or international relations are being discussed. It doesn’t excuse such behaviour, but it’s nonetheless worth pointing out that this doesn’t make Abe a fascist or evil; it just means that he’s a politician. Besides, popularity barely matters. Though it’s taking its toll on the government’s approval rating, the LDP and its coalition partner, Komeito, could pass the bill through the Diet by themselves, having secured a large majority in the hastily called general election last December. Opposition politicians have resorted to frankly bizarre measures to register their displeasure, holding aloft placards during committee sessions and physically mobbing rival politicians in scenes bordering on fist-fights. The refrain, over and over, is that a bill with such low public support cannot be passed through the Diet in this manner. This is, for better or worse, utter nonsense. The public does not support this legislation, but it hasn’t been sprung upon them as a surprise; changing the basis on which Japan’s military participates in international security is one of Shinzo Abe’s most long-held and clearly expressed desires, and the constitutional re-interpretation enabling this new law was passed before the general election last December. That election returned Abe’s LDP and their Komeito partners with a slightly larger majority than they had before. Any government, anywhere in the world, would look at that situation and conclude that whatever the public’s misgivings about this specific legislation, the LDP’s mandate to pass it is unarguable. Opposition parties were unable to turn the public’s dislike of Abe’s military ambitions into votes last December, so what aspect of democracy (as distinct from constitutionalism), exactly, is Abe riding roughshod over by passing a bill he’s openly been promoting since 2012? It’s not that I don’t understand the anger and fear surrounding the bill, much of it focused on Abe himself. For all that he has learned to shut up about his own revisionist views of Japan’s Imperial history and decidedly neo-conservative ideas about how to make Japan’s society “beautiful” again (much of which is, as with neo-conservatism in general, little more than Fascism Lite with far less snazzy uniforms), he has been altogether less successful at getting other members of the LDP to do likewise. A great deal of the protest around the bill seems to be based not so much on fear of what collective self-defence will mean for Japan, but on a broader fear that Abe and his party want to move Japan away from the post-war pacifist consensus; to promote an ultra-nationalist agenda through schools and universities, to construct and impose rigid concepts of morality and “traditional” notions of societal duty, to adopt a more aggressive stance on the world stage and generally to return Japan to its more oppressive pre-war status quo. Opponents, who have dubbed the security legislation as Abe’s “War Bill” (which I use entirely facetiously in the title of this post), see that bill as being a huge step along the way to that objective. They’re not wrong about Abe’s objective; you only need to read the man’s own words, in his book “Towards a Beautiful Country“, or look at the wish-list of constitutional change he and his LDP colleagues came up with before he came back to power in 2012. A man’s personal ideas and the policies he pursues in government may not always align, but it’s not unreasonable to fear the objectives of a man who has clearly laid out intentions to change his nation’s society in dangerous and worrying ways, and whose rule in government is effectively unopposed due to chaos within the ranks of opposition parties. This broad unease only lends itself to making the protests and opposition to today’s bills seem fractured, discordant and uncoordinated. Part of the problem is that taken on its own merits, the bill is entirely reasonable. One may argue for or against the need for Japan to change the terms on which it engages with its security partners, but there are a great many logical and reasonable grounds for the claim that collective self-defence is required by the present international environment. For Japan to continue to exist securely under the US defence umbrella, even as the global influence of the US is increasingly challenged and the broad security environment of Asia remains unstable, seems untenable. A more even relationship in which Japan’s substantial military prowess forms part of the deterrent to conflict across Asia, and in which Japanese troops play a normalised part in activities such as UN Peace-Keeping Operations (as those of other militarily neutral countries, such as Ireland, do without difficulty), has much to recommend it. Ranked against that, protests claiming that this “War Bill” represents a rise of militarism – despite the fact that even with its implementation, Japan’s military engagement will remain pretty much the most restricted of any developed nation – are all too easy to dismiss. Herein, perhaps, lies the core dichotomy and problem of Shinzo Abe’s leadership of Japan. His person suggests that he should be a disastrous leader – he is an unrepentant (if recently wisely silent) historical revisionist with barely-concealed fantasies of a return to the social and political order of Imperial Japan. His ultimate goal is a complete rewrite of Japan’s constitution which would dispense with its pacifist and human-rights oriented nature in favour of a stricter, more duty-focused constitution which he believes to better reflect “traditional” Japanese values. In some ways, this personality has indeed been disastrous; relations with China and South Korea, for example, deteriorated sharply under Abe’s leadership, though it’s unfair to lay the entire blame for that at his doorstep when the leadership of both of those countries demonstrated equal if not greater intransigence and historical dishonesty. In other ways, though, this personality and the stances it has created have been almost exactly what Japan needs; Abe’s policies have been pushed through with a force and vigour that has been sorely lacking in Japan for decades, and have seen kickstarts to employment, to inflation, to the role of women, to the broader economy, and to necessary adjustments to the nation’s international role. In each case, one can argue that Abe has pursued the right policy for the wrong reason – often horrifyingly wrong – but nonetheless, he’s achieved more in his years in power thus far than anyone since Junichiro Koizumi in the mid-2000s (and Koizumi, I’d argue, pursued the wrong policies for the right reasons, which is far worse). Abe’s personality and his party’s regular gaffes colour everything they touch. Even as a supporter of its content, I will find it deeply uncomfortable to watch the “war bill” pass today, with the storm-in-a-teacup of protest making little or no odds to its progression through the various stages of government. I will find it even more uncomfortable if the Supreme Court, a far less aggressive and independent branch of government in Japan than in the USA, permits the bill to stand despite its extremely dubious constitutionality. I’d like to see Japan’s security position change, but I’d like to see it done right – with a constitutional amendment by popular vote, following a proper campaign of education and outreach about the reasons for its necessity. When a politician’s vigour and force extends to simply ignoring constitutional legalities, then no amount of democratic mandate (which, again, the LDP unquestionably possesses at present) can justify their actions. But perhaps that’s Abe in a nutshell; doing the right things for awful reasons, in awful ways, and making even those who support the actions uncomfortable along the way. He may be the most effective prime minister Japan has had in decades; he may simultaneously be the worst leader the nation has had in the post-war era.